This modification has been done for many years by road racers and car builders. It is way more involved than installing sub frame connectors but will ultimately provide more stiffness to the chassis. With this system the front end loads are carried down the front frame rail, through the torque box, into the inner/outer rocker and directly to the rear torque box. 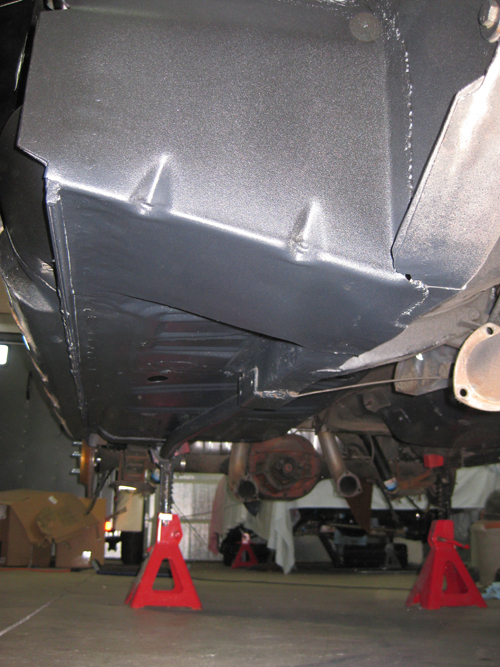 With conventional subframe connectors the forward ends of the subframe connectors are welded to the flimsy front frame rail extensions which deflect up and down as they are only spot welded to the thin floor. 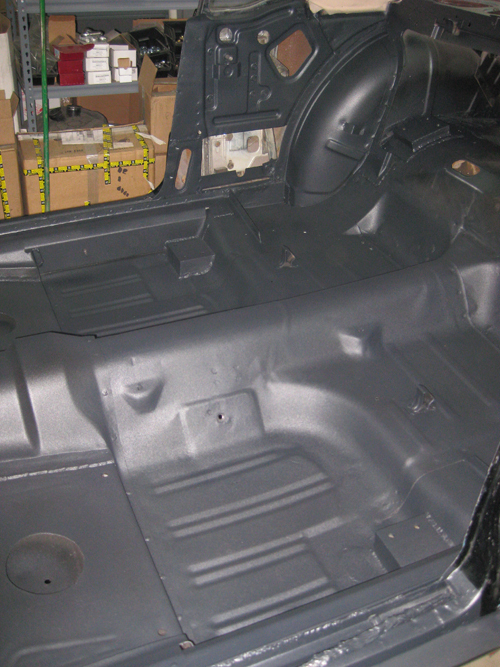 The neat thing about this method is that by purchasing a convertible carpet and kick panels, all the additional bracing can be covered up to look factory. Only the observant would notice what was under the carpet. This option is also advantageous to those wishing to run a side exit exhaust because you'll have no subframe connectors in the way. While ideally done on a non-painted car, with care, this can be done to a painted car and was on the pictures below. 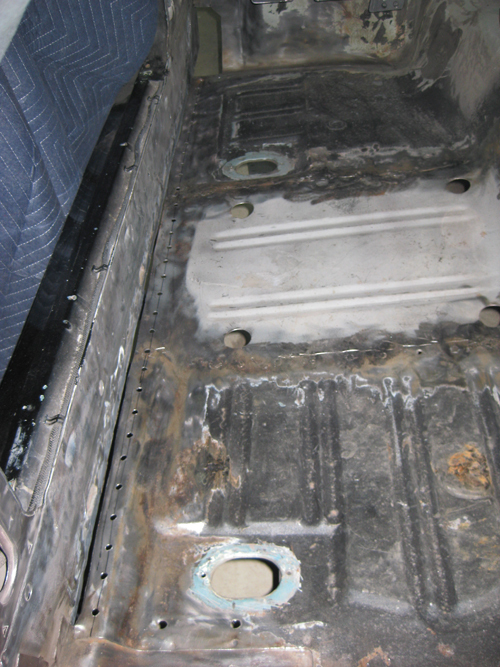 The car pictured is a 66 coupe, some steps may be different for other years. Assortment of wrenches, sockets, screwdrivers and miscellaneous tools for removing interior/front suspension etc. Using a 1" wide chisel, scrape off the seam sealer around the area where the torque box will install. Then, using a knotted wire wheel on a angle grinder, clean the area back to bare metal. Make sure to wear gloves, hearing protection and a full face shield as dust and debris will fly all over the place! Next we cut a hole in the floor extension for the convertible inner rocker to slide through and a slot for the inner torque box piece to slip through into the interior. Using a spot weld cutter you'll also need to remove the flange that is spot welded to the outer rocker. This will enable the convertible inner rocker to sit flat against the outer rocker. On this car for some reason the outer rocker forward of the door kicked upward slightly. This was the same on a 65 we had in the shop and confirmed by a few other internet forum members on their cars. We just lined up the inner/outer rocker flush from the front of the door rearward. If the inner rocker protrudes lower than the fender we can always cut off part of the inner rocker lower flange. We were not able to plug weld the inner rocker to the outer along the bottom flange so we plug welded the outer to the inner. Now to fit and install the torque box. To make installation easier, we separated the 2 halves of the torque box. You can install them as one piece but its a lot easier in 2 parts. 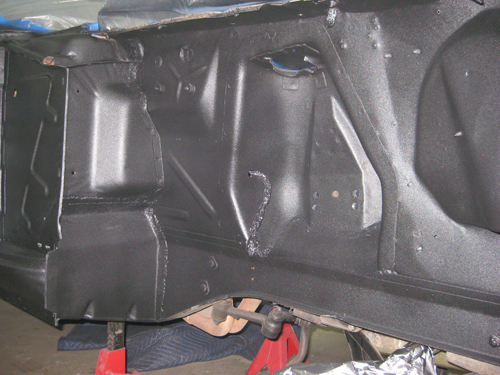 This also gives you the opportunity to paint the inside really well before sealing up the area. This car was destined to be a track car so I wanted the seat as low as possible. 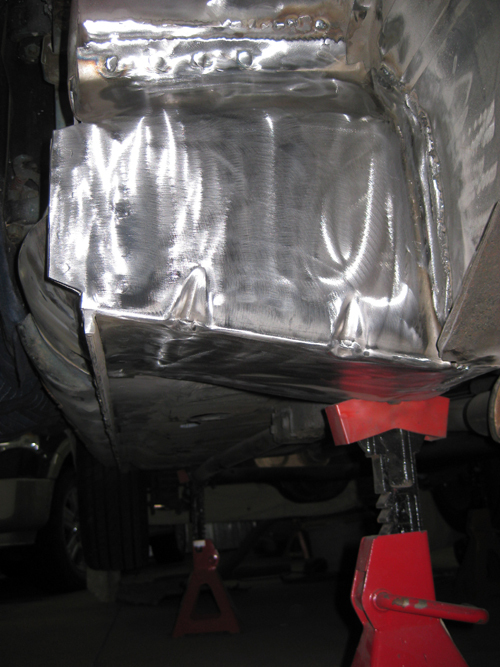 After the extensive modifications shown below to lower the convertible stock pan it lost most of its rigidity. Due to this I would actually say that if you want lower seat pans to modify the stock type as it is a lot easier.